The Zambian Kwacha has been steadily losing ground against major currencies and is about to reach K5000 against one US Dollar. Starting from late July upto early August, the Kwacha appreaciated to trading around K4800 to one USD. But this appreciation was due to political and not economic measures. The PF regime introduced the statutory instrument (IS) number 33 that prohibits transacting in foreign currency for domestic transactions. But that political measure has run its course and the natural law of demand and supply is in control. 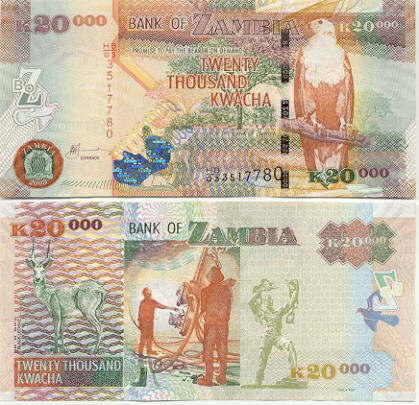 The bank of Zambia reported on Monday August 27, 2012 that one US Dollar was going between 4,902.59 and 4,922.59. One Great Britain Pound was selling between K7, 752.96 and 7,785.57 while the Euro was going between K6, 143.93 and 6,170.96.